I am not sure which young black man’s death prompted this art piece. It’s not that I don’t care; I just can’t remember. I just know that I feel like I can set my watch to the gun violence that erupts seemingly every hour on the hour. At the same time, people wonder why the African American community can’t just move past things. Why do we harbor such fear, frustration, pain and anger? Why? Because the past is the present and seems to be the future. 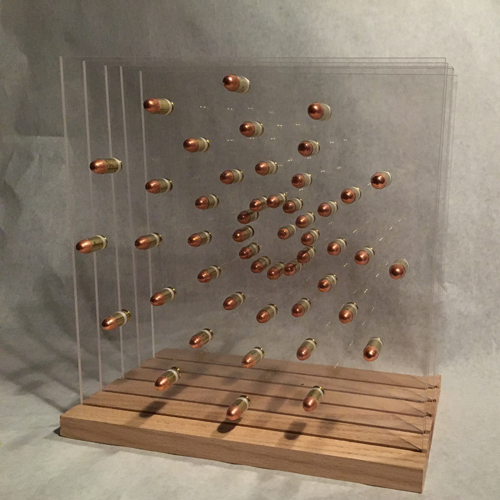 I’ve called this piece “Time Doesn’t Heal All Wounds.” It is constructed of oak, Plexiglass and 49 bullets. It starts with one, way in the back. Each subsequent layer consists of bullets to which you can set your watch. Each one occupying a space on a clock reserved for measuring time. Each layer expanding wider and further. Each layer disrupting more lives. Each layer ending more lives. If you stare directly at it, you can see your reflection. You can see the impact. You can see the target. But you have to look at it. If you don’t look, you pretend that the layer upon layer upon layers don’t effect you. Stare at it. This is an epidemic. I make art as a means to communicate and understand. I am confused by our priorities: right to guns over right to life. When will we get over it? When the bullets stop expanding. When people stop dying. When the layers stop.